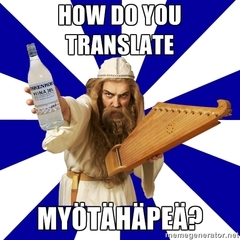 Today I learned a new Finnish word that I think we should introduce in English: Myötähäpeä. Kaj Sotala described it as "co-shame" or "shared shame": "Feeling bad as a result of seeing someone else do something that causes them to embarrass themselves in the eyes of others." It is a kind of empathetic opposite to Schadenfreude. I find it interesting that there seem to be many more "untranslatable" (i.e. unique to one language) words for mental states than other things (the other standard category where cultures differ a lot is words for relatedness). Just look at this and this. These lacuna words are largely semantic gaps: one could usually just add a word for the concept with the right grammatical form and everything would work. The mental states themselves often carry over with no problem between cultures, although how often they would come up or how one would behave and express them would vary a lot. The fact that the states are so often in just one language suggests that it is more these uses than the state itself that determine whether they get to be a word or not. Every morning when I leave home I pass by my gate post, and I briefly look at the flat stone surface for "concept of the day". Today it was "surprise shadow" - the unexpected confluence of a shadow with a particular surface. Yesterday it was "the feeling of dryness due to sun after a rain". Other fun examples have been "the feeling of missing a habitual action", "awareness of the ubiquity of very pale green colours" and "potential white dust too small to see that may or may not have been there". It is a fun exercise. It also demonstrates that it is very easy to construct new concepts: each of us could make literally thousands every day, yet our languages at most run into hundreds of thousands of core concepts. For the rest, we combine the others rather than invent a new proper concept and try to introduce it into language. This is a kind of competition process: myötähäpeä is far more relevant, cohesive and useful than surprise shadows.